Give your bedroom decor a dash of mystery with this Stunning Decorative Mask. Follow this tutorial on how to make a decorative mask and you'll have an elegant and memorable piece to add to your collection. Doodle on the mask freehand or use stencils for a more professional look. Add gems, glitter, and sequins to turn this mixed media project into a truly dazzling piece of art. 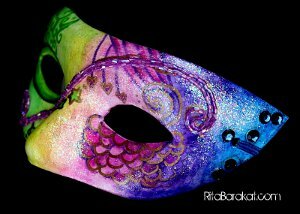 You'll wonder why people bother buying decorative masks when they're so fun and easy to make. Draw shapes on mask and trace them with PITT pens. Erase any pencil marks. Add color by drawing with various gelatos, blending colors with a wet paint brush. Adhere gems and beads with glue pen. Use Sparkle Mod Podge to add several layers of shimmer.